As I wrap up my trip to DC to present at the GDG meetup (with huge turnout ~200: thanks, everyone! 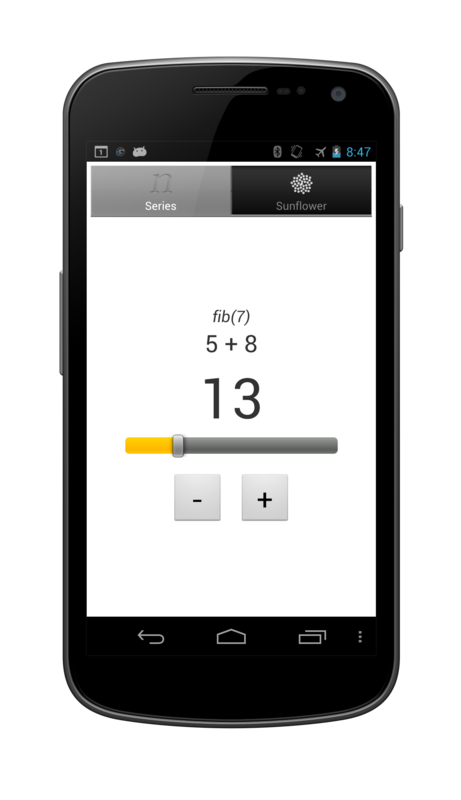 ), I thought I would take my own medicine and update my Fibonacci app to make it more accessible. The main improvement was to add a couple of buttons to the Series tab which are much easier to use with TalkBack than the slider bar. In addition, I added some <android:contentDescription> tags to assist the screen reader. Here is the latest source code and the app in the Google Play Store. Call me a geek, but I get a kick out of uploading new APKs to the Google Play Store while on the plane. This entry was posted on September 7, 2012 at 8:11 pm	and is filed under Android. You can follow any responses to this entry through the RSS 2.0 feed. You can leave a response, or trackback from your own site.